Some animals that live in the ocean defy description. It’s hard to tell if they’re a plant, an animal or something else altogether. 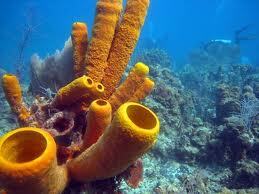 These animals include sponges, sea urchins, coral, star fish, jellyfish and sea anemones. They don’t look like most animals, but they don’t look exactly like plants either. 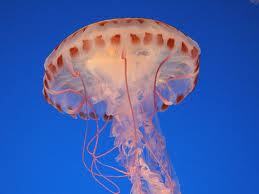 The jellyfish, for example, looks like a blob of jelly with long trailing tentacles. Coral are attached to the ocean floor. They’re hard and knobby. They almost look like rocks, but they’re not. Coral polyps are tiny animals related to sea anemones. They have a hard limestone skeleton that they attach to a rock or the ocean floor. This is the beginning of a coral reef. Once attached, the polyp starts making clones of itself and the coral grows. 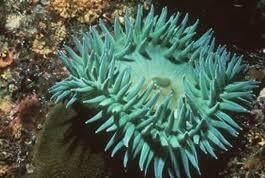 It joins other polyps to make huge reefs. Algae grows on the coral, which colors it. Coral reefs provide shelter for thousands of marine animals. Pollution threatens coral reefs. Sea anemones have a foot that attaches to a rock or the ocean floor. They have stinging tentacles. When a fish touches one of the tentacles, barbs shoot into the fish. The barbs are venomous and paralyze the fish. The tentacles guide the fish to the animal’s mouth. Lunch is served. Jellyfish have lived on earth for millions of years. They were here before the dinosaurs. Jellyfish have a soft body that floats through the water. Food goes in a hole in their bodies. Poisonous tentacles paralyze prey. Some jellyfish are dangerous to humans. The Portuguese Man-of-War is said to be as venomous as a cobra. Even dead jellyfish sting. 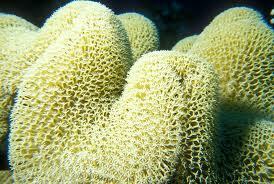 Sponges are animals that live on the ocean floor in colonies. Their bodies have lots of holes and canals. Their skeletons are used as sponges for cleaning. Tarpon Springs, a little town in Florida, was built by Greek sponge fishermen. They still hunt for sponges today. Another strange underwater creature is the Jellyfish – it has a soft body that floats through the water. Food goes in a hole in their bodies. Sea anemones have a foot that attaches to a rock or the ocean floor. What a strange undersea life form! A video documentary of the secrets of the deep and the lives of strange undersea creatures. Coral polyps are tiny animals related to sea anemones. They have a hard limestone skeleton that they attach to a rock or the ocean floor. Question: What are sea urchins? Answer: Sea urchins are small animals that are covered with spines. They live on rocks or the ocean floor and feed on bits of plants and animals. Many sea urchins have poisonous spines. Question: Do these animals have body parts like other animals? Answer: Usually not. Jellyfish, for example, don’t have a brain, heart or blood. Enjoyed the Easy Science for Kids Website about Strange Undersea Creatures info? Take the FREE & fun Strange Undersea Creatures quiz and download FREE Strange Undersea Creatures worksheet for kids. For lengthy info click here.